Moms who have adopted their babies also commonly go through a blue period. And now that investigators have begun to look into it, we know that most dads (though less weepy) go through a blue period of feeling unhappy, insecure, left out, and moody. One day I expect we’ll discover that even dads and adoptive moms have sudden hormonal and chemical changes in response to a new baby — but this has not been proven. We do know, though, that even at this exciting time of having a newborn, there are good reasons to be blue. Every new beginning is also an ending of what was before. Every ending is a beginning. Whenever a baby is born, the world will never be the same. This is wonderful. It’s also okay to grieve for the loss of the way life was before. You no longer have the control of your own time the way you once did. Perhaps you also miss the challenges and rewards of work. Hobbies may have been put on hold for a while. Your romance is also now different — it’s no longer just the two of you. Whether pregnancy was comfortable or not, you may be mourning the special intimacy of feeling your baby kicking. 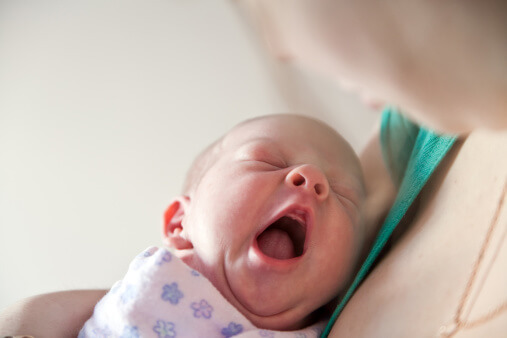 Many new moms describe feeling empty inside. Pregnancy is a time of looking forward to an eagerly awaited moment. Now, the looking forward is gone as well. Also, pregnancy breaks down barriers in society. Complete strangers would beam at you, want to pat you tummy, and remark how you’re glowing. They might leap up to give you a hand. Now your baby is increasingly the focus of attention, and even though you would probably benefit more now from encouragement and practical aid, you are less likely to get it. You may also be mourning the loss of your ideal appearance – you may still look pregnant. When my youngest child was one month old, a door-to-door saleswoman greeted Mom and asked when the baby was due! (Needless to say – no sale!) Wearing maternity clothes when pregnancy is over just isn’t as fun, but usually nothing else is comfortable yet. Now add to all this – SLEEP DEPRIVATION!